This is a step-by-step blueprint for airline employees, their family and friends on how to maximize their airline travel benefits. 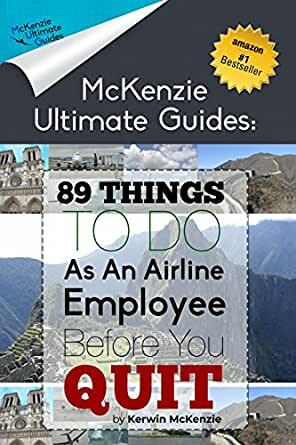 The book presents 89, well 91 different travel experiences an airline employee can and should experience before leaving the airline industry. 5.0 out of 5 starsDon’t miss this great guide! Great Guide for active and retired airline employees especially those new in the industry. Kevin has done a great job compiling destinations and possible options on how to arrive to them. He has also given me new ideas for my future traveling. Great Gide to keep. I highly recommend it! Great resource for the airline employee who has already done all of the "obvious" trips. Handy market-specific travel tips, and un-obvious destination recommendations from a former employee who lives for the next trip - wherever that may be!